Poised on the edge of the beach in the center of Midtown, this beacon of hospitality welcomes you with open arms and a spacious floor plan! If you like to be close to everything Cannon Beach has to offer, Lighthouse #301 is the home for you; you’ll be just steps to the sand and an easy walk to fine dining, coffee, galleries and shopping options. This comfortable home is meant for family living, with room for everyone to gather and let the ocean carry your troubles out to sea. Bring along some chew toys for your pups to play with - this home is also pet friendly! Two love seats and two easy chairs make a cozy spot with a gas fireplace to warm up cool evenings. There’s a 55” flat screen TV for movies or the big game but the real show is the rolling Pacific, filling the picture windows with unending entertainment. If you’re eating indoors, there is room for eight at the dining table, or take your meals outdoors to the expansive deck, fantastic for entertaining or some solo time with the paper and a coffee. With four picnic tables, there’s room for friends, so bring a few along! Once you're done with your BBQ, take the private beach entrance down to play in the waves. Built all on one level, Lighthouse is easy to navigate; there are no stairs! Close to the living room you'll find the first bedroom with a king sized bed and across the hall is the family bathroom. The 2nd bedroom is the Master suite, with a queen sized bed and private bath with a tub/shower combo. Down the hall, bedroom #3 features a full size bed and a twin bed, a 32” flat screen TV/DVD player and a writing desk for catching up on important correspondence. Next to that, bedroom #4 has a queen bed, 48” TV/DVD player and writing desk. These rooms share a bathroom, with a tub/shower combo for soaking after salty days on the beach. There is also a washer and dryer conveniently located next to the bathroom. Take a heading for Lighthouse #301 and schedule smooth sailing for your next beach vacation! Thank You, it was all great and will def sonit again! Continues the best of service year after year. 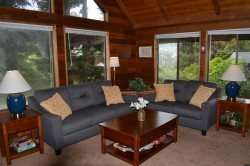 I've been extremely satisfied with CBVR, and will continue to use you guys when we're looking for a house in Cannon Beach (we try to make it to the coast once a year)! Thank you! The staff was very friendly and helpful throughout the entire process. Our family beach house -once a year!